FastComet provides a large number of responsive and free OpenCart themes. They are created as a quick-start installation packages, which will allow you can install them on your account easily. The actual installation will set up a new OpenCart instance, the theme and all of the extensions that are required to use it. Our free OpenCart themes are intended for new websites. They contain a quick-start package and cannot be installed on an existing OpenCart website. To help you get started with OpenCart our Technical Support team provides Free OpenCart Theme Installation. The look on your OpenCart online store is one of the most important things that you need to consider, before you start the actual development. A beautifully designed OpenCart store will attract more customers and sell products better. We understand how important this is and we have designed a number of free and responsive OpenCart themes that will turn your website into a top online store. For more information on that, you can review our Free OpenCart themes. The first step of the process is to review all of the available themes and locate the one you will match your needs. Then, you can download the free OpenCart theme by clicking on the big Download button at the top right corner of the themes's page. For the purpose of this tutorial, we will install the Aurora OpenCart theme. The next step is to extract the files of the quick-start package on your local computer. You need to create a folder first and then extract the files in it. This will ensure that you do not leave any files behind. The next step is to upload the files of the quick-start installation package to your account on the server. The most important thing that you need to consider is where you would like to install the theme. In our example, we are installing the theme in a subfolder called “store”, which means that we need to create such a folder within the public_html/ directory of our account and then upload the theme files in it. To initiate the quick-start installation of your OpenCart theme, you simply need to point your web browser to the location, where you have uploaded the theme’s files. 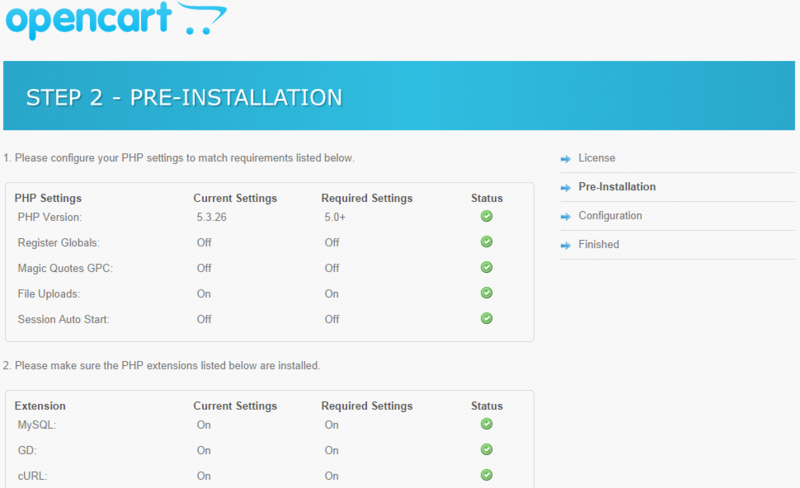 This will automatically redirect you to the installation screen of OpenCart. The first step will display the License agreement for the use of OpenCart. 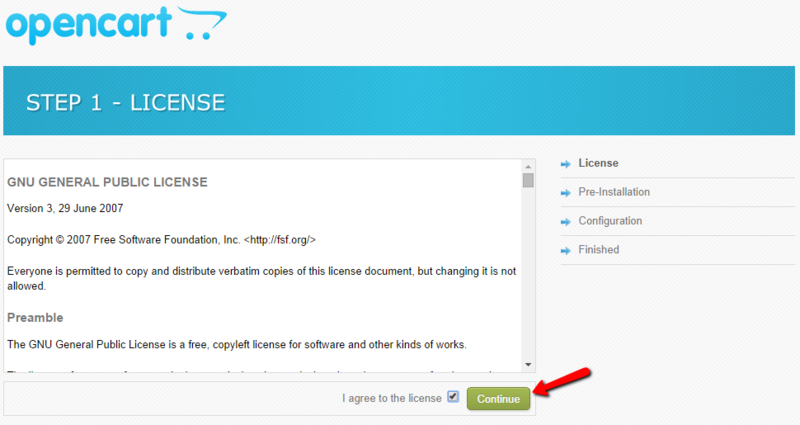 You will have to read it and then tick the I Agree To The License checkbox to proceed. The second step of the process will check if the hosting server matches the minimum requirements of an OpenCart installation. As FastComet servers are fully optimized for OpenCart, you will not have any warnings here and you can safely proceed to the next step. E-Mail - Set the administrative email for your new installation. 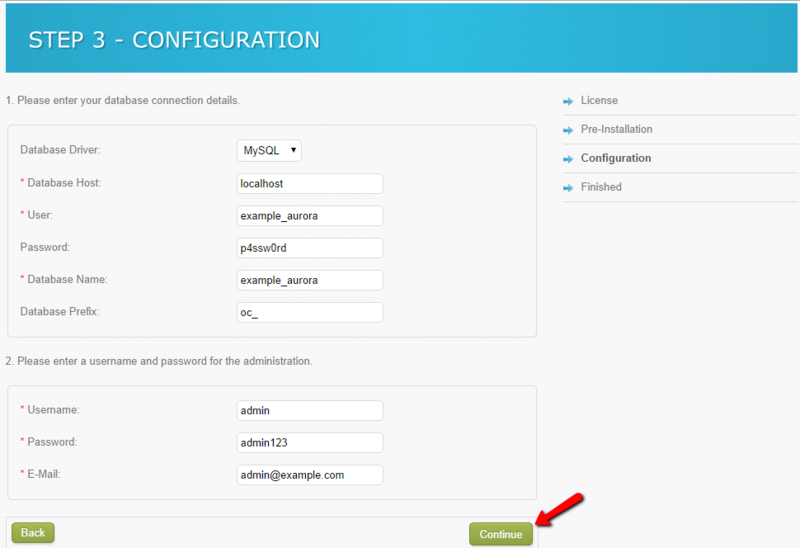 To create a new database and a user assigned with full privileges to it, you need to access your cPanel account. Locate the Database section and access the MySQL Database Wizard service, which will guide you through the process. The system will then proceed further and complete the actual installation automatically for you. It will also display direct links to your new website’s frontend and the administrative area. The last step is to remove the install/ directory. For that purpose, you need to access the location on the server, where you have uploaded the quick-start installation files. Then, simply locate the install/ folder and remove it completely. Congratulations, you have successfully installed a New Theme for your Opencart.